If you love the cheery beauty of spring wreaths, you’ll be delighted with this decorating twist. Instead of using a spring wreath on a door or wall, bring it to your table and pair it with a sweet decoration. This tabletop display has a romantic and sentimental quality… because spring wreaths and home accents are made for each other! It only takes a few seconds to create a breathtaking spring centerpiece. Click here to view all the spring wreaths and home accents mentioned below. First, select a spring wreath in a size that is fitting for your table. If you or someone in your house has sensitivities to fragrant scents, choose a faux flower wreath rather than a dried one. Next, measure the center opening. Choose a home accent that will look lovely nestled inside, making sure that it will fit nicely in the center. Use your imagination! LED lanterns, sculptures, lighted accents, and birdhouses are just a few of the items that would look fabulous. Keep in mind that a full, elaborate wreath will look best with a simple adornment in the center. If necessary, elevate the decorative accent; below, we used a green floral foam block covered with a bed of dried Spanish moss to prop up the cherub sculpture. 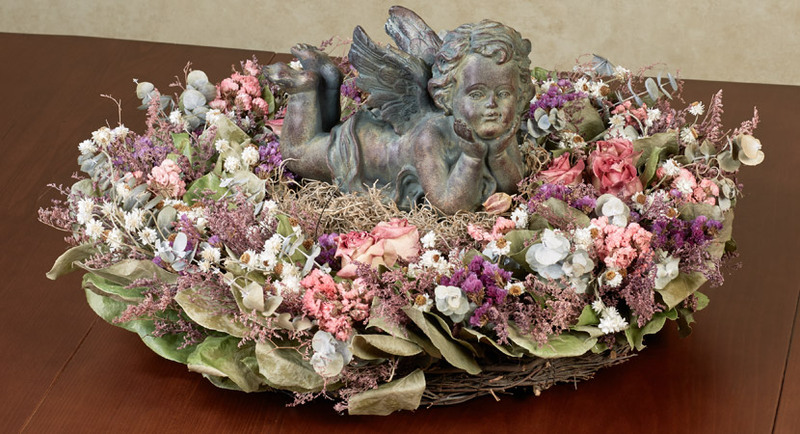 The Daydreaming Cherub Sculpture has an innocent expression and a darling vintage aesthetic. Give this heavenly creature someplace special to rest, like inside the Ella’s Rose Dried Floral Wreath or the Wild Daisy Floral Wreath. Even a garden accent can be used as a centerpiece decoration! Charge the Secret Garden Solar Lighted Accent in direct bright light, then display it in a pretty wreath. 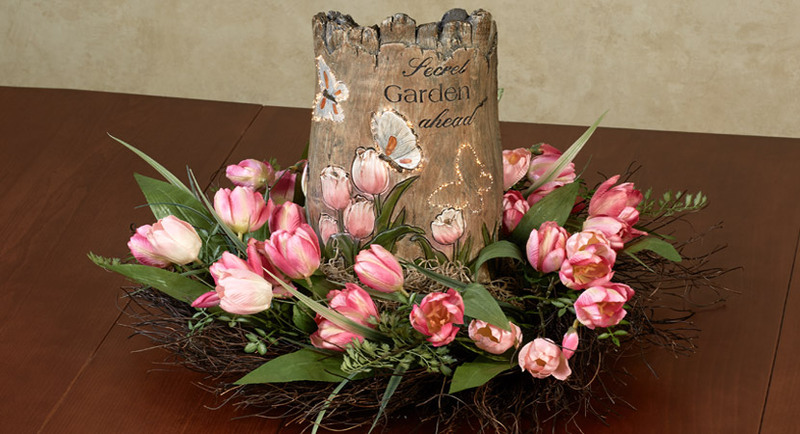 We chose the Pink Tulip Wreath to complement the floral designs on the lighted accent. An LED lantern provides your display space with just the right amount of accent light, without the worry of candles. 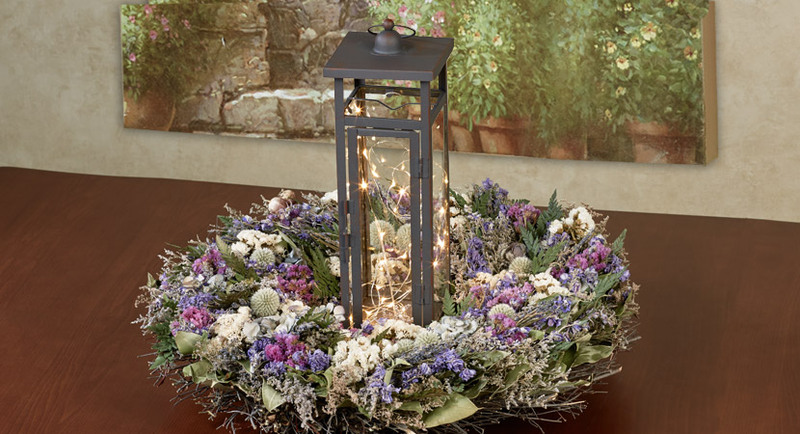 The Twinkling Twilight LED Lantern has a five-hour timer and includes batteries, making it even easier to assemble this spring centerpiece. We placed it inside the handcrafted Thistle Dried Floral Wreath for a twilight beauty akin to fireflies dancing above wildflowers. If you prefer a rustic ambience, use a weathered-looking decorative birdhouse as the center accent. We chose one of the birdhouses from the Hanging Birdhouse Set. 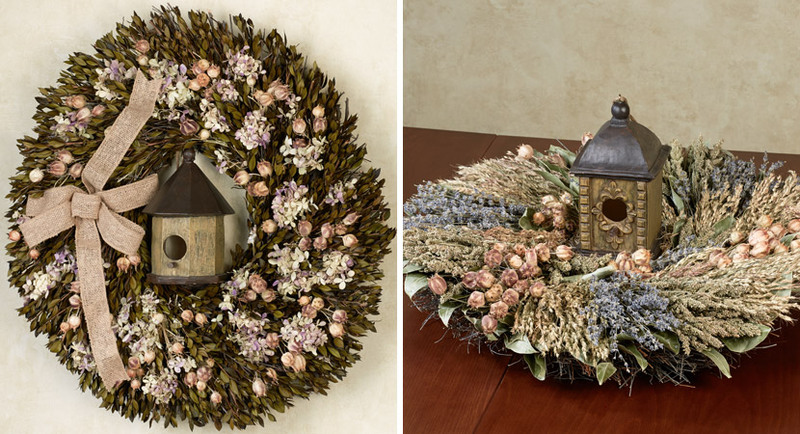 Place it inside an earthy-looking wreath, like the Organic Vida Dried Wreath (shown at right). The subdued, natural tones create a subtle display that is still a pleasing take on spring decor. We also placed one birdhouse inside the Bella’s Garden Wreath and displayed it on a wall (shown at left).